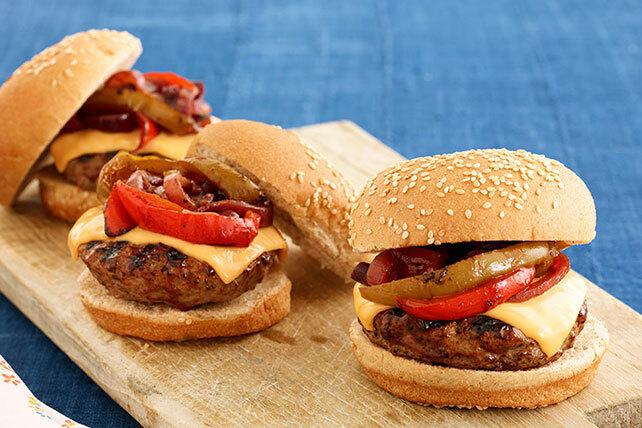 Perfect your next cookout with our BBQ Grilled Steak Burger recipe. Topped with green and red peppers and cheesy KRAFT Singles, the BBQ Grilled Steak Burger is always a great choice. Place vegetables in center of large sheet heavy-duty foil. Mix barbecue sauce and steak sauce; drizzle 1/2 cup over vegetables. Fold to make packet. Grill 15 min. Meanwhile, mix meat and 2 Tbsp. of the remaining barbecue sauce mixture; shape into 8 (1/2-inch-thick) patties. Turn packet over. Add burgers to grill; grill 8 to 10 min. or until done (160ºF), turning burgers and brushing with remaining barbecue sauce mixture after 5 min. Remove packet from grill. Top burgers with Singles; grill 1 min. or until melted. Fill buns with cheeseburgers and vegetables.